For many pet owners, dog or cats become a part of our family and they are loved and taken care of just like any other person in the family would be. Which means that we also designate a space for our pets to play in, just like we would do for children. Dog playpens are great not only for disciplining our dog but also for providing a secure and safe place for our pet to rest in and take a timeout. Brands all over the world provide different crates and playpens, which have very different designs and are made out of various materials. But, some of them might not be the best option when choosing a playpen, which needs to be not only comfortable and stylish but also safe for your pet. The main attribute which should be considered when shopping for a pet playpen is how easy it is for your puppy to get out of the playpen. 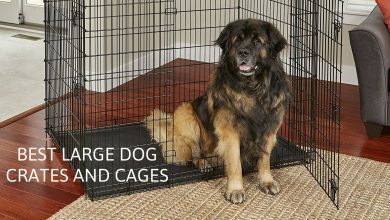 You should consider the size of your pet and choose the right playpen. However, since there are many different options, styles, and companies producing various playpens, here is a review of some of the best dog pens to help you choose the right one for your dog. Zampa is an international company which offers all kinds of pet products from safety belts to dog playpens and pet hair shedding clean-up tools. Their main concern is creating a product which will help pet owners and pets themselves. And, since a company that is so concerned about animals and pet well-being has to have products which are made out of the best materials and with an exceptional quality you can rest assured that Zampa products will be great and fulfill all of your requirements. The Zampa pens for dogs are a great place for your pets to relax in and feel safe and secure in. 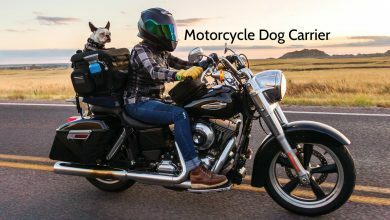 They are portable and can be taken with you on road trips or on vacations, wherever you need to take the dog pen. As it is foldable and collapses easily taking up little space you will have no difficulties when transporting the dog pen. And even a carry bag is included with the purchase. The floor sometimes causes difficulties and inconveniences when talking about doggy playpens. Yet the Zampa playpen comes with an attached floor, which is very durable and long-lasting with protected seams and reinforced corners for durability. Comparing to other similar playpens, the Zampa dog playpen is water resistant and the playpen itself is quite spacious providing enough space for your pet to play and sleep in. Overall this pup pen is a great option if you are looking for a dog playpen which is designed for outdoors and indoors, is water-resistant, and which is easily transportable. 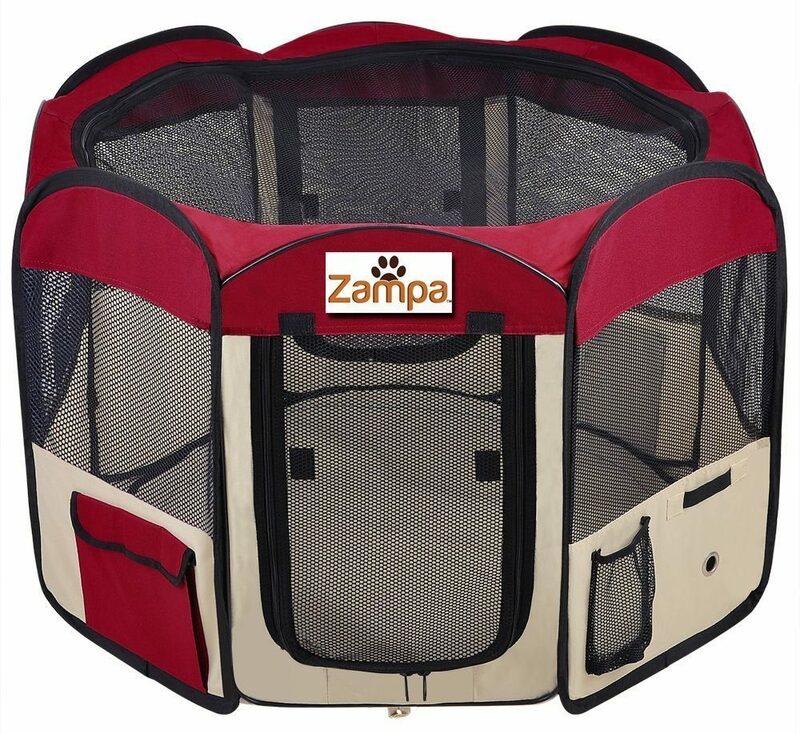 Additionally, the Zampa pet playpen folds down completely flat and comes with a carry bag. 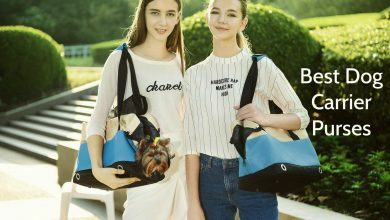 It is also equipped with a water dispenser hole where you can attach specially designed water bottle, with a bottle holder, and exterior side pockets which are a great place to keep treats and supplies in for your pet. Elite Field Company is an international manufacturer which distributes and offer pet accessories, like playpens and crates. They have a large variety of different products in their offer and all of them are designed and meant for your pets. Elite Fields know what the best design option is in order for your pet to feel comfortable in the playpen and for the product to be long-lasting and efficient. 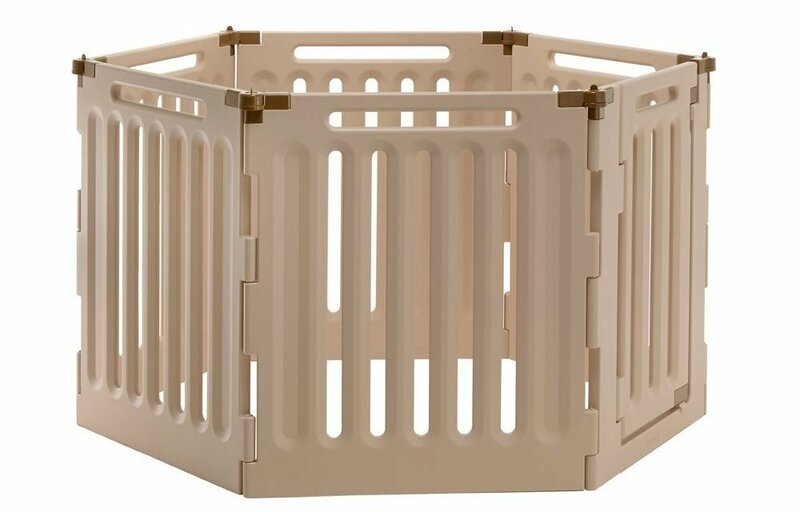 The Elite Fields dog pen is available in eight different sizes and has nine various color options – beige/green, beige/navy blue, beige/black, beige/brown, beige/maroon, beige/green, beige/orange, beige/royal blue and beige/sage green. It sets up and folds down in seconds and won’t require a lot of effort. 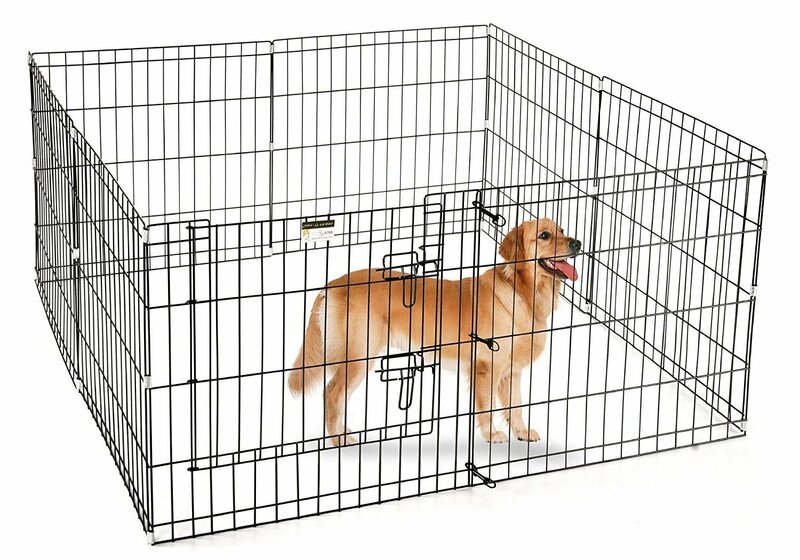 The dog playpen has two doors with a locking zipper so that there is no possibility that your pet might escape the pen. Although the zippers have a lock on them, they are made out of plastic in order to be lightweight, so can be easily broken by larger dog breeds. Also, two accessory pockets are included in order to provide some extra storage for your pet’s treats or toys. This pet playpen also has a water bottle pocket and a holder so you can easily provide your pet with fresh water at all times. Because of the materials used in the production of the dog playpen, this dog pen is well-ventilated, lightweight but still proves to be strong and durable. And lastly, this is one of the only dog playpens, which has a removable zip-off floor mat that is also washable in case of an accident. 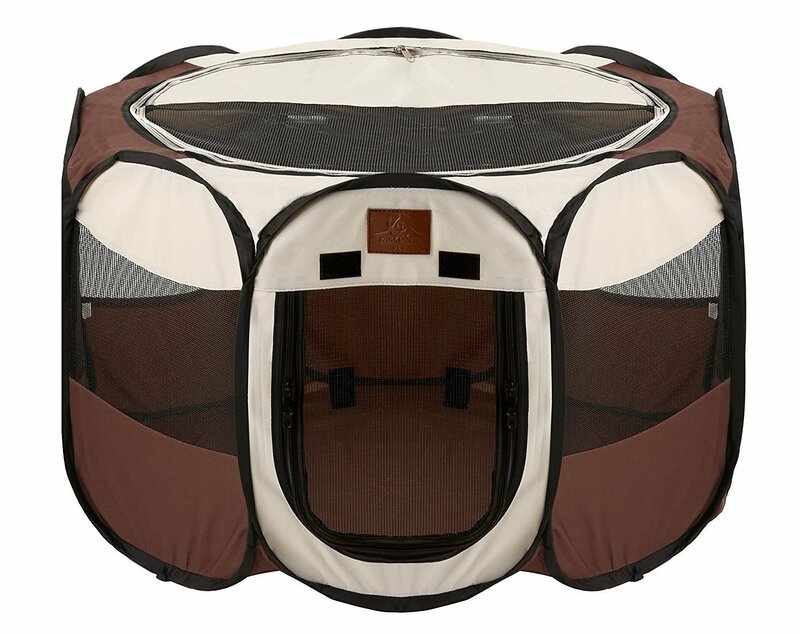 Overall, this is a great choice and investment, if you are looking for a comfortable and great quality doggie playpen, which can be used also for other animals. Parkland Pet Company is an international company selling and manufacturing animal care products, the most popular of them being pet playpens. They have proven their effectiveness and quality to their customers time and time again, gaining a lot of recognition and becoming one of the best-known dog playpen manufacturers available. The Parkland Per dog pen is designed for outdoors and indoors use providing a safe and secure place for your pet whenever it is needed. It does not require a lot of effort when setting the dog playpen up or folding it back down. It takes up only a few seconds of your time. When you fold the pet playpen down it becomes flat and takes up little space for easier storage. This playpen for dogs is also lightweight and can be transported or even taken with you on trips and when going camping. It has a zipper on the top of the playpen so you can access your pet easier and also, it has a zipped door on the side of the playpen so that your dog can walk in and out without any difficulties. The bottom of the playpen is made out of very thin plastic material, therefore it is not water resistant at all, so in a case of a water spill or toilet accident, liquids will get through and ruin your floor or carpet. The cleaning and the playpen itself would be better without the bottom layer at all, as it would make the cleanup process easier. Overall, a great product for indoors and outdoors despite the poor choice of floor material. 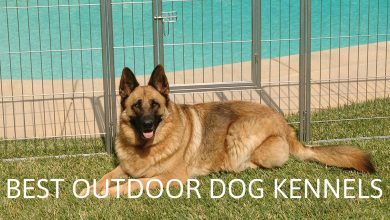 It can be taken on trips and camping and will provide your pet with a safe and secure place to play and rest in. 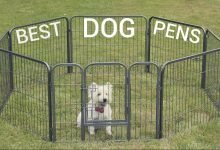 You can also use the dog pen as a tool to discipline your doggy, when you are going out to the shops for a couple of hours or when welcoming any guests. The manufacturing of this pet playpen is North State, who is USA manufacturer which has been in the business since 1953. They are creating and distributing many different products that are exceptional in quality and durability. The line My Pet is producing and developing products for pets and pet owners in order to make life easier and more enjoyable for all. 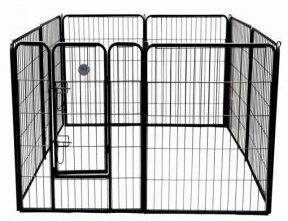 The dog pen comes with six removable and adjustable panels, which can create up to ten square feet large area and are 30 inches high. You can put together the panels and adjust them as necessary and as needed for your home. And if the six panels aren’t enough, there is an option to purchase a play yard two-panel extension, for enlarging the pet playpen. The panels can be made into not only dog play pens, but also they can be mounted on a wall as a fireplace screen or stair barrier. One of the panels for these dog playpens is equipped with a swinging walk through the door, which is safe-proofed for children so that your pet has an easy access to their playpen and you can easily access it, but your child won’t be able to get into the dog pen. It can be used indoors and outdoors, without worrying about ruining the floor and surfaces as the pet playpen won’t scratch the surfaces. But it does not have a floor mat included, so you might want to keep an eye on your pet in cases of toilet training and if food is provided inside the doggie playpen. Overall this is a great choice if you are looking for a very sturdy and qualitative dog pen, which is made out of metal and has several different purposes than just providing a playpen for dogs. IRIS USA Inc. is a company located in the United States of America, who manufactures and distributes stylish and long-lasting dog playpens. But, they are not only producing doggy playpens, they also make other products out of plastic, for example, plastic storage boxes. And all of the products coming from the IRIS USA Inc. are manufactured out of heavy-duty and strong plastic to help customers with organizing their homes. 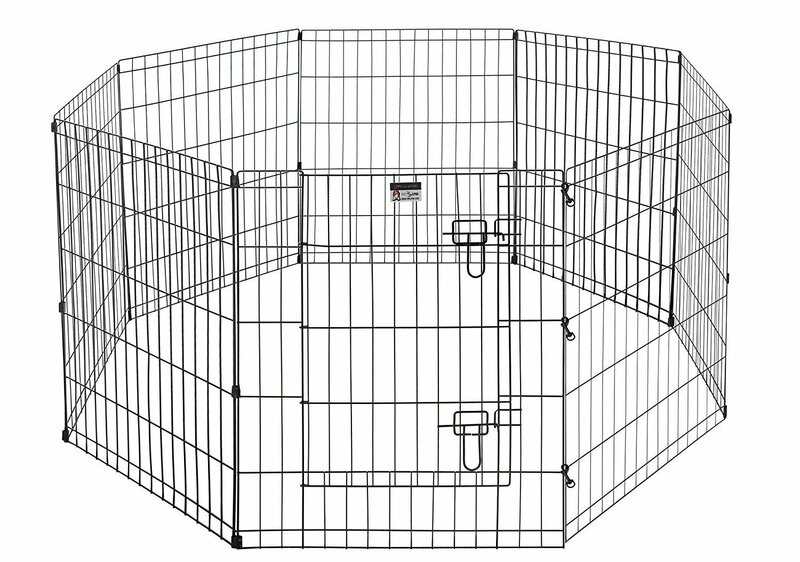 The IRIS 34 inch dog playpen is set up from eight separate panels. It can be used both: indoors and outdoors as the IRIS playpen is made out of strong, heavy-duty molded plastic which is extremely durable and long-lasting. This doggie playpen is portable and can be moved wherever it is necessary. But, comparing to other similar playpens, this one will take a little effort when setting it up and taking it down as it has eight separate parts, which need to be attached together and door latches that need to be installed. One of the eight peace’s come with a door worked into it, which has steel latches for safety. Also, you can order a two-piece add-on panel kit is if extra space is necessary for your pet or any of the pieces gets ruined. This playpen has multiple uses starting from play and exercise area to using it as a training tool. It is available in eleven different colors, white, red, pink, green, gray, frosty white, chrome, brown, blue moon and blue, proving customer a choice when selecting the dog pen. Overall the Iris playpen is a great choice if you are needing a sturdier and more secure dog playpen and if you are willing to put in some extra work when setting it up and breaking it down. Richell is an international company selling their goods worldwide through different online resources. They provide a large variety of different products, including pet care tool, like dog play pens. Richell has very trustworthy and qualitative products, which are made with great quality and will exceed all of your wishes and needs. 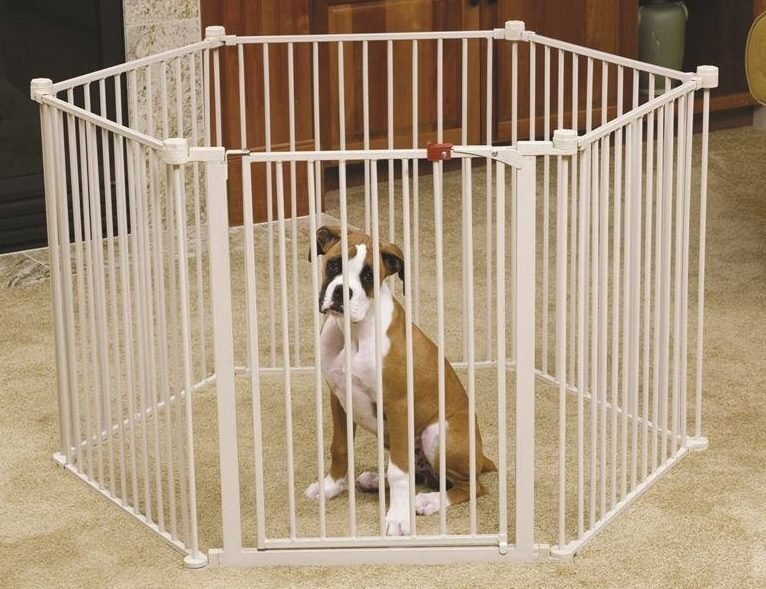 This dog pen is a 3 in 1 product, as it is made either out of four or six separate panels and can be made into a dog playpen, freestanding pet gate or a room divider. It can be used both indoors and outdoors, as the playpen for a dog is water resistant. The product is made out of durable plastic which will be long-lasting and the playpen is going to be sturdy. 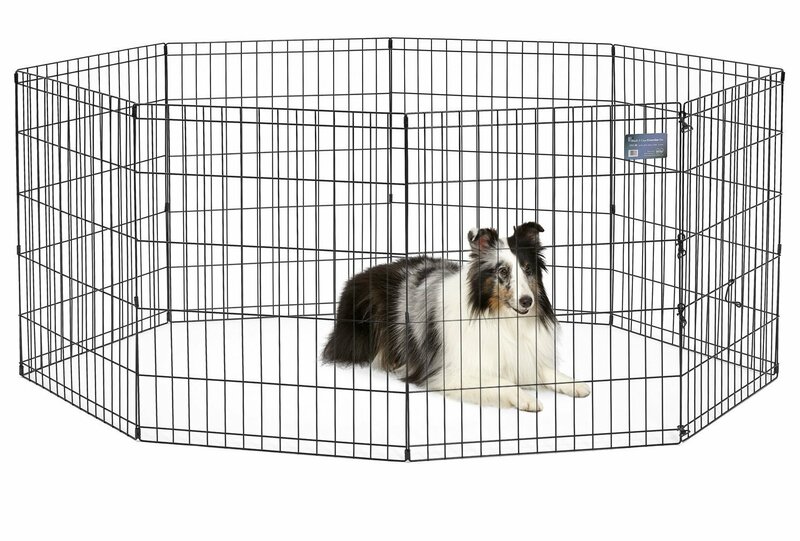 It easily converts from dog pen into a room divider. 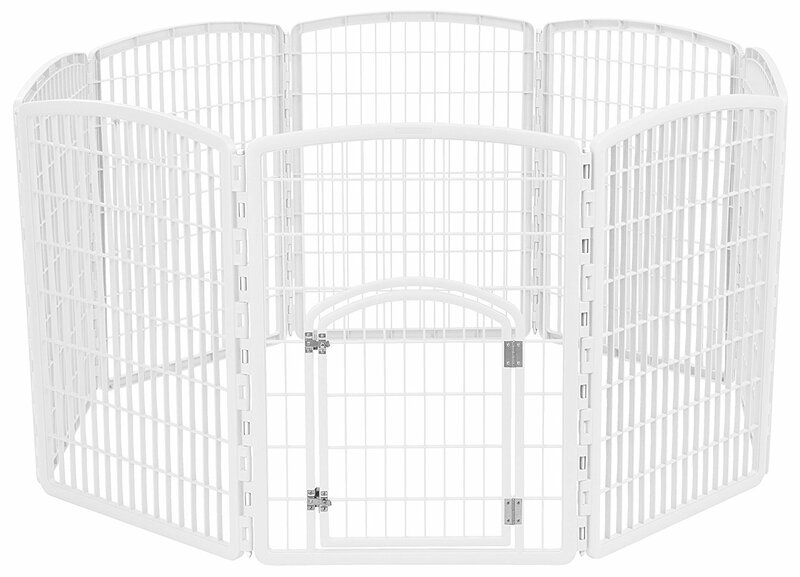 The Richell dog playpen has a lockable gate door, so that you can easily access your pet in the playpen, but also so that your doggie does not escape. Also, if you use it as a room divider, the gate door ensures that you can freely move from one room to another without any hustle and rearranging. The specially designed caps lock the panels so that they don’t move around and the dog playpen or gate is stable. 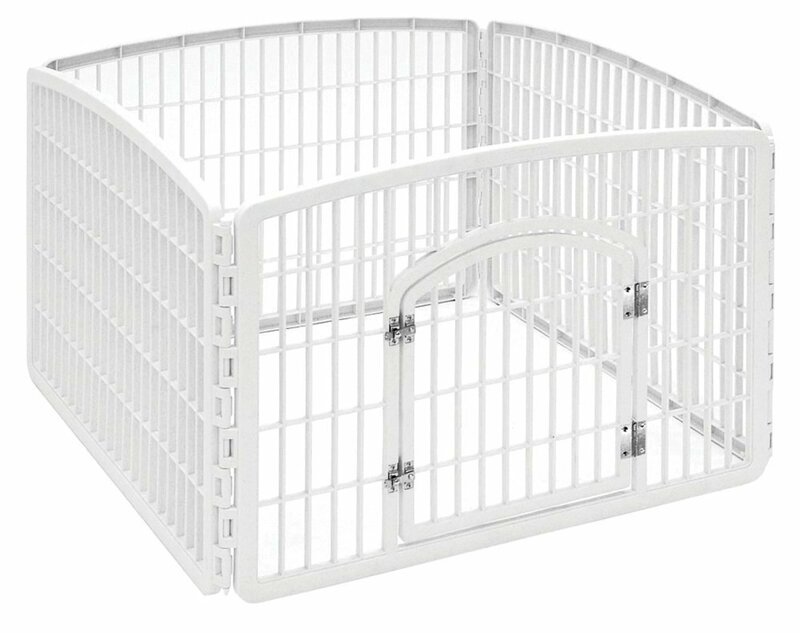 Overall, a great pet playpen if you are looking for something sturdy and a product which can be made into a gate. This playpen for dogs is easy to assemble and clean. Also, it comes with a comfort mat which can be used on the top of the doggie playpen, in order to provide shade or it can be used as a mat on the bottom for extra comfort. And you can also purchase a floor tray if you prefer to have extra safety underneath the playpen. The manufacturer Pet Trex is a trustworthy and reliable company, providing great quality products. Their pet crates are made out of great material so they are sustainable and long-lasting. Pet Trex has always been greatly concerned with their customers and the communication they provide, hence you can expect great customer service, fast replies and receiving your purchase on time from them. Overall, Pet Trex is a great company, selling their products all over the world, and providing great quality items and good customer service. 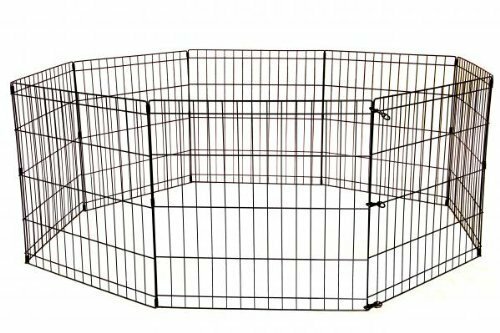 This playpen for dogs is made out of quality heavy gauge wire in order to be long-lasting and sustainable so that your pet crate lasts you for a long time. The gauge wires are in a satin black coating, treated with an anti-rust treatment so the playpen can be placed outside without any hesitation and worry. You can use the playpen either outdoors or indoors. It can be set up and taken down within a few minutes and does not require any tools. And, you can fold up the pet playpen for easier storage and transportation. It includes eight separate panels, which can be adjusted together in any shape necessary. The first few designs did not include a doggie door, but they have evolved the design and now the playpen comes with a doggie door, so your pet can easily enter and exit the pen. If you want to place the crate outdoors, it comes with ground anchors so you can secure the playpen in the right spot, without any possibilities to move. Corner stabilizers are also included so that the playpen holds its shape. And if you want to make sure that your pet stays in the crate, the creators have added secure slide door latches, for safety and security. Overall, a great pet playpen, but because it is made out of thin metal material, it will not be appropriate for the bigger pet breeds, as they will have no problems getting out of the playpen. And, even though, the ground stakes are included for outdoors, if you use this playpen indoors it has a tendency to slide around and change shape and location. But, despite these downfalls, this is an efficient playpen which is thoughtfully designed. This playpen for dogs is designed and sold by an online company called Best Pet, which are manufacturing different products for dogs, cats and other pets you might own. They have playpens, crates, playhouses, grooming tables and even pet strollers. Their main task is to provide products which will be easy to use and products that will make life easier and enjoyable for pets and pet owners. You can find The Best Pet products online through different online stores because by selling online they can reach more customers all over the world and their products can be enjoyed in many parts of the world. This pet playpen is made out of metal, which is in a powder coated finish so that the metal lasts longer and has anti-rusting properties. Although the pet pen is available in only one color, black, it goes nicely with many colors and will fit into your interior well. It can be used as a playpen, but also made into a kennel or even a dog gate. Although it won’t be very sturdy as a gate due to the material and thin metal used in the production, it will hold back the smallest breeds. For easier transportation this dog playpen collapses into a suitcase style and is very lightweight, so you can take it with you on vacations or road trips. Also, a slide out plastic tray is included so you don’t have to worry about maintenance in cases of accidents as it is going to be easily cleaned. Overall, this playpen for dogs is a great investment if you are an owner of a small dog breed and you are looking to purchase a playpen for your pet, which is going to be great for indoors and outdoors and which can be taken on trips and vacations. The manufacturer Go Pet Club has been operating since the year 2003 and has proven their quality and become one of the leading manufacturers and sellers of pet furniture and accessories all over the United States. They offer many different products for pets and animal care, from different furniture items, like playpens to grooming accessories. The Go Pet Heavy Duty Pet Playpen is rust-resistant and the steel frame is made out of half inch steel tubes. The playpen is coated with a black color finish to make it long-lasting and durable and appropriate for outdoor use. The exercise pen consists of eight separate panels, which are designed to be set up together in any shape or form desired, as the panels are adjustable. The dog Go Pet Club pen is great for providing a safe and enjoyable environment for your pet, where your doggy can rest and enjoy themselves. The metal wore steel construction is durable and long-lasting, ensuring many seasons of usage. There are several size options, for different breeds and sizes of pets, and if you own multiple dogs. All in all, the Go Pet Club pen is well made and worth the money. It comes in multiple sizes and can be adjusted to individual needs. Moreover, if you have larger pets or want to crate more than one doggy, there is a possibility to put together several playpens and create a larger play area. Although the playpen is designed for indoor and outdoor use, it will be more stable outdoors, as there are ground stakes which are meant to be secured in the ground for the stability of the pen. And the door is very small and will be more appropriate for smaller breed dogs. But, despite these small issues, the dog Go Pet Club pen is great quality, durable and worth the money. Mid-West is an international company that provided all kinds of home appliances, which are designed to make life easier and more enjoyable. Their pet playpens have been designed so that your pet has a nice and pleasant place to rest and the owner can discipline the pet when necessary. The playpen is quick and easy to assemble, and will not require a lot of effort to be put into the adjustment of the play pen. It comes with clips which hold the panels together and allow it to be configured into any size wanted. Also, it folds flat down for easier storage and transportation. When assembled, panels create 16 square feet of space for your pet to feel comfortable in and can be used either indoors or outdoors. There are optional tops available, for security and safety of your pet. The tops are made out of mesh and secure that your pet has no option to escape. And these tops will protect your pet from the sun and other influencing factors. But, they are not included with the playpen, they can be bought separately. Overall, this playpen can be used inside and outdoors, it can also be taken with you when going away on trips as it is portable and folds flat down. It can be adjustable and set up within minutes as no tools are required to set up this pet playpen. Also, ground anchors are included with the playpen in order to secure it in place when placed outdoors. And lastly, the metal is coated with a durable black finish which will protect the pen against rust. But, despite the coating, still be careful when it rains as the coating will not protect the dog playpen against the consequences of rain. Smith Built is an affordable and great quality manufacturer, which is selling their products all over the world in more than fifty countries. They are proud to be using only the best quality materials and designing the most effective products possible. Smith Built evolves and develops their products and manufacturing techniques all the time, therefore we can expect the latest innovation from them. All in all, Smith Built is a great company, which takes into the consideration their customer needs and researches products and market situation all the time, which results in products being made with latest innovations and techniques. 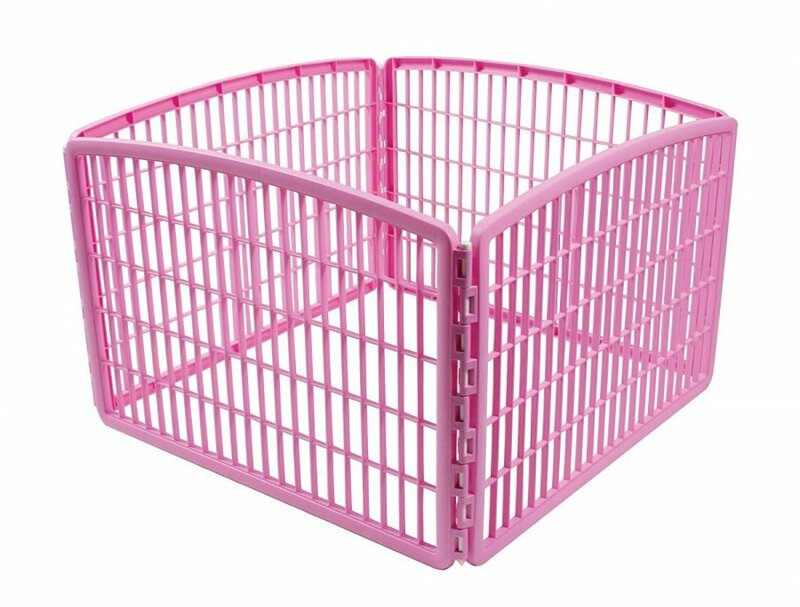 This particular pet crate is made out of gauge all-steel wire material and coated in a technique which reduces the chances of rust and makes the product long-lasting. The playpen comes fully pre-assembled and you have to put in little effort to set the pen up. It will be ready within a few minutes, and the playpen can be taken down also just in few minutes. If you want to store the pen or take it with you on trips, it folds nearly flat, therefore the playpen won’t take up a lot of space. Also, a carry bag is included for carrying and storing the playpen. The playpen can be used for many different purposes: for training, as a kennel or as a playpen. The six panels which are included can be converted into any shape and size necessary, the most popular is an octagon playpen. You can form a 4-foot by 4-foot square, a 6-foot by a 2-foot rectangle, a 5-foot diameter octagon, or even a 16-foot long fence/barrier, which can be used to restrain your pet from entering any area of the house. The pen has a door, which easily closes with a slide-bolt latch. Even though the pen is made out of strong steel wire, it won’t hold wild and rowdy pets, therefore it is advised to train your dog before you leave it unattended in the playpen. This dog playpen is manufactured by the same company as the previous playpen, the Pet Rex, which is an international company selling their products all over the world through online stores. The Pet Rex Company has introduced a strict quality control for their products so that the customers receive only the best products. And they evolve and develop the design of their playpens and products all the time, to make sure the products reach all expectations. This eight-panel Pet Rex Playpen is adjustable out of eight different panels and can be used either outdoors or indoors. It is an easy setup and take down and can be folded up for easier transportation and storage when not necessary. It has a step-through door access, for comfortable use for pet and for the owner. As instead of you having to take your pet out and placing them back into the playpen, the animal can move freely in and out of the pen using the doggie door. Which can also be closed shut when necessary, using the slide bolt latches, which are designed and made out of heavy-duty metal for extra security. Overall, this is a great choice if you are looking for a playpen which is going to be securing a small or middle-sized pet, as it will not hold large dog breed well. The fold-down design ensures that the playpen can be taken on trips and stored when not in use. Also, this playpen is equipped with ground anchors and stabilizers so that the dog playpen hold its shape, and does not move out of place. However, ground anchors will be useful for securing the playpen only outdoors, as indoors the playpen still can be moved out of the designated place. 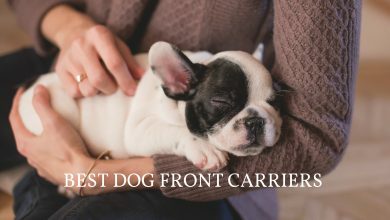 Carlson Pet Products is a manufacturer who makes safe and comfortable pet products that are great for the owner and pet. They have several different product lines of gates, play yards and pet beds, which are made with great quality and are long-lasting. All, in all this company, values their customers greatly, therefore, products are designed to fit everyone’s needs and to be helpful and convenient for pets and for their owners. The Carlson Pet crates are flexible and provide multiple different configuration options for your house and outdoor areas. You can create large playing areas for your pet, or make a dog gate which will restrain your pet from entering specific parts of the house. 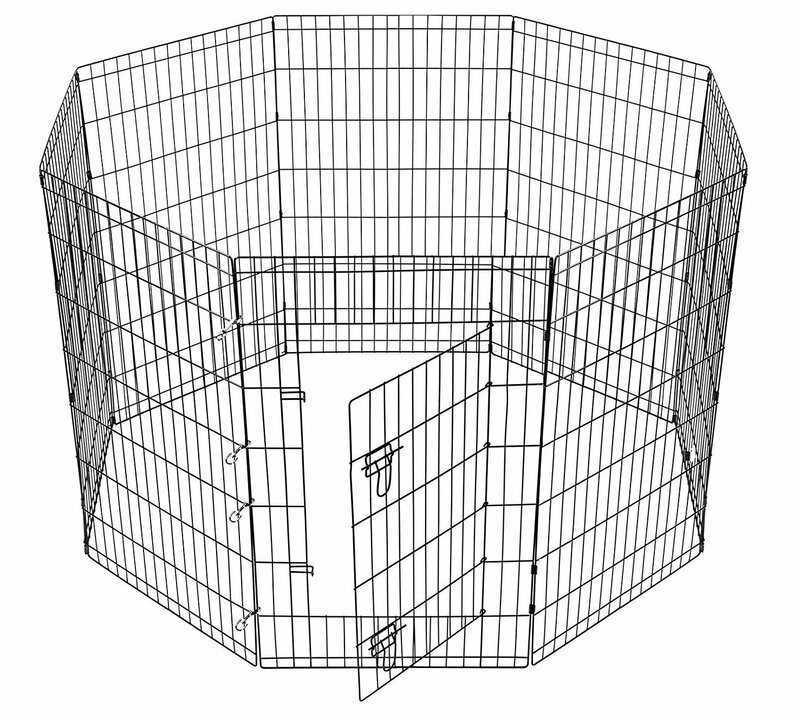 Altogether there are four different ways how you can configure the playpen (a stand-alone pet yard, a fireplace guard, a safety gate and free standing barrier) including an octagon playpen. 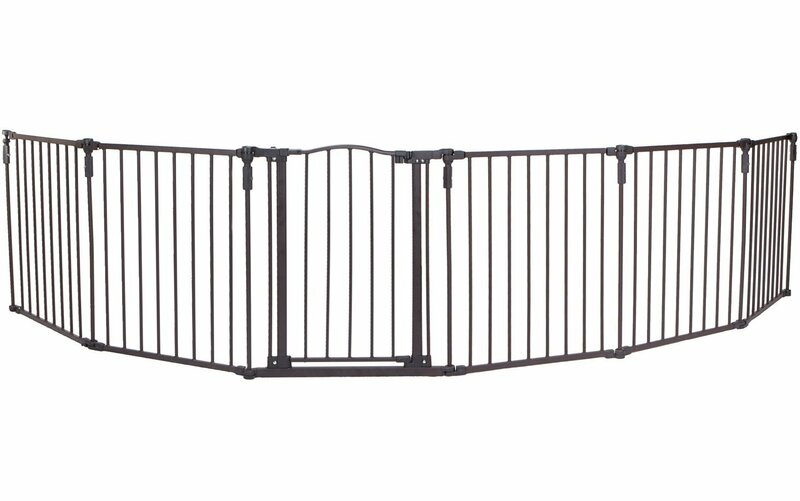 And, if you are in need of a slightly bigger playpen you can purchase additional panels for it that can be added to the pen. The pen is made out of sturdy, chew-proof steel, which is durable and will hold the shape very well. It can be folded up for easier transportation and storage if necessary. Also, a walk-through door is included as the pen can be made into a gate that keeps pets from entering a specific part of the house or as a gate for stairs. The doors are equipped with a one-touch safety release lever so that it is extremely convenient to walk through it if you want to enter the blocked areas. Overall, this is a great option if you are looking for a long lasting pet playpen, which can be configured into gates that keep dogs from entering specific areas of your home or garden. The last playpen is manufactured by the already discussed company Iris USA Inc. This playpen can be used indoors and outdoors, according to your own preferences. It consists of separate panels, which together can form up to eight square feet large playpen. But, if it isn’t enough you can still buy two additional panels which will create an even larger territory. The panel is portable and easily moved around as it takes only minutes to put it together and to disassemble it. The panels are made out of heavy-duty molded plastic same as other products from Iris USA Inc. This plastic is very great and long-lasting, and will hold its shape well. You can use the Iris USA Inc. playpen for various purposes, for example for training your pet or for providing a safe play area for your furry friend. Whichever purpose you choose, Iris will provide a safe and efficient environment for you and your pet. Iris USA Inc. is a company which has been already reviewed above. It is an American company, which distributed and manufactures pet playpens that are long-lasting and great quality. 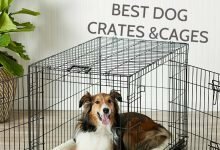 The fact, that more than one playpen has made into the Best Dog playpen review proves how great and effective playpens designed by the Iris USA Inc. are. 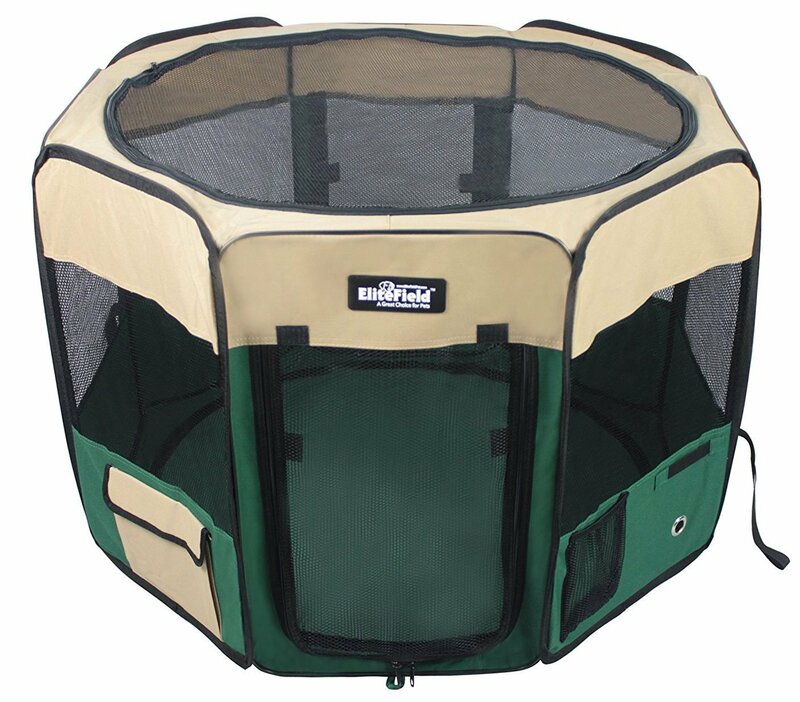 This playpen is great for playing, exercising or training your pet as it can be used both – indoors and outdoors. It is made out of heavy duty plastic which is durable and resistant to force. Moreover, the playpens will stay fresh and won’t rust for several seasons, so you are not purchasing a one-time product, the pen which will serve you for years. This Iris USA Inc. playpen is recommended for smaller breeds or puppies, as it won’t hold in large dog breeds successfully. The panels of the pet pen interlock securely with full-length connection rods and the playpen itself can be configured into different shapes depending on your needs and necessities. The playpen itself is light-weight and can be easily disassembled in case you want to store it or for transportation. As many of similar pens are sliding all over your floors and tend to scratch them, the Iris USA Inc. playpen has non-skid rubber feet on all of the panels, so that your floors are safe from getting damaged and the playpen does not slide all over the place. All in all, this truly is a great playpen, which can be used indoors and outdoors, is easy to put together and fast to disassemble. If you need more space for your pet, there is an option to purchase panel add-ons, which will increase the size of the pen. The materials used in production ensure that the playpen will be long-lasting and won’t rust for years. Overall, pet playpens differ greatly in size, from the materials used in production, to the playpen design styles and many other characteristics. When deciding on purchasing a playpen you should keep in mind your pet. If you have a puppy research the size and behavior of a grown dog, as the playpen might be appropriate for a puppy but won’t be effective when the dog is all grown up. Although you need to put in effort and time while researching the best dog playpens and figuring out which is the most appropriate for your doggy, it will all be worth it in the end as the suitable pen will be more effective and safe for your pet and for your needs. And, lastly, don’t choose a playpen for your dog just from reviews and other recommendations as every pet are different and you need to take into regard your pet and its needs. You might enjoy one playpen but it can turn out to be completely unsuitable for your pet’s needs.